High Performance Talks is our weekly interview series focusing on improving performance through better health and wellbeing. In the course of ten weeks, you will hear fascinating stories from racing drivers, top executives, entrepreneurs, university professors and our very own Hintsa experts. 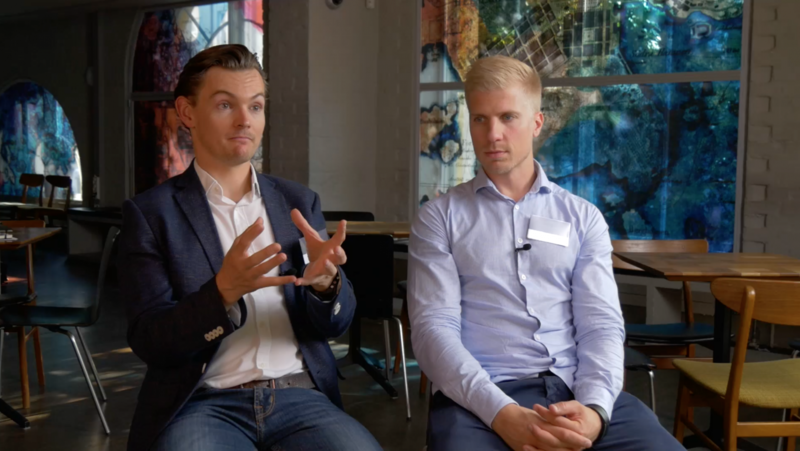 In episode 4 of our series Hintsa’s Head of Science and Innovation James Hewitt and Coaching Director Heikki Huovinen discuss how physical activity affects people’s cognitive abilities and provide some easy ways to boost your brain power. What’s your take on the Hintsa model? “For me, the distinctive of the Hintsa approach is that we don’t impose something onto people. I think that typically in health and wellbeing programs, someone will do an assessment, they will find all the things that the person should be doing and they can even create a program integrating all those different practices, but the problem is that often it’s still imposed. Those new ideas and new programs are imposed onto a life that’s already saturated. There’s no energy or space available to do anything new. Whereas with the Hintsa approach we start from the inside and work out. We start at the beginning and ask our clients: what do you really want to achieve; what are you doing now; and are the things that you’re doing reflecting what you really care about? Then we frame the different new activities, the new behaviors, in the context of something they really care about, something they’re really motivated to change, a goal that they really want to achieve. That way, the change is much more sustainable. What advice for exercising would you give to busy professionals? “Simply moving more is really beneficial. Actually there’s some interesting evidence that suggests that even if you exercised really intensively for one hour a day – you go to the gym, you do your weights, or your spin class – if you don’t have any incidental activity, i.e. you’re sedentary, you can completely undo the positive benefits of that exercise. What about cognitive abilities? How does physical activity affect them? “Simple interventions, even such as standing up from the chair is good for your cognition because it will instantly elevate the heart rate 10-20 beats and that will spike a little bit of adrenaline to your body and help the blood pressure stay constant. That’s an immediate boost for our system and for our cognition. In other words, your brain is better fuelled when the blood is pumping correctly. When you exert your energy to physical activity, it actually enhances your cognition. In one interesting study, a group of 8–9-year-old kids was assigned a 70-minute after-school physical activity program for 9 months. And because of this intervention, their cognitive function was improved, much more than that of the control group. Their VO2 max, i.e. their maximal oxygen uptake level was improved, but also their cognitive functions. In addition, these kids who were more physically active actually had higher academic achievements and better grades. And how does physical activity boost an individual’s energy levels? And how about the effect of physical activity and energy on the overall wellbeing? “First, you need to really find the internal motivation and you need to build your environment right. Many times we actually are so low on energy, that perhaps the best thing actually is to just rest, recover and sleep. And after that come back stronger, and then do the exercise. “One other thing that is really important to remember, is that energy comes from a single source. There’s a single inner resource, and our nervous system, liver, heart, and our brain, they all require the same kind of energy, something called ATP. So, when we’re upgrading our engine through physical activity, and are able to supply more energy, all these demands are drawing from that same pool. So if you think about cognition, or emotions, or physical activity, actually all the things we do during the day, can all pull from that same energy source. What would be your one final advice for the readers?